Making your auto repair easy! Turn to Mac's Auto Repair for All of Your Auto Repairs & Vehicle Maintenance needs. 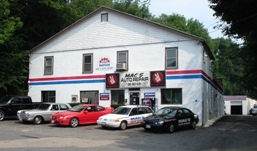 Mac's Auto Repair is a family owned and operated, full-service, preventive maintenance and auto repair center located in Cherry Valley, MA 01611 area but also servicing surrounding towns including: Worcester, Auburn, Leicester, Oxford, Charlton, Spencer , Holden, Paxton, & East Brookfield. We even have customers from as far away as Nashua, NH, Chelmsford, MA and even Cape Cod! We specialize in 4x4 Services, Alignment, Brakes, Car & Truck Care, Domestic Cars & Trucks, Electrical Services, Electronic Services, Engine & Transmission, Engine Maintenance, General Services, Heating and Cooling Services, Import Cars & Trucks, Inspections and Emissions, Miscellaneous Services, Tires, Towing, Transmission Services and Undercar Services. The only repairs we CAN NOT perform are Manufacturer Warranties and Manufacturer Recalls! We have the knowledge and expertise to service and repair the most challenging auto problems on all makes and models of domestic and import vehicles. We use the latest technology to assess the situation, identify the problem, and provide you honest recommendations. We will only begin repairs on your vehicle once we have your consent to proceed. I've tried other auto repair shops in Leicester and find Mac's to be the most honest, I never worry they will recommend something that isn't necessary. Best place ever good honest people who are friendly. Fair price and good service! I've used this shop perhaps 10 times. They always meet or beat expectations. What's really exceptional, though, is how well they explain to a customer what needs to be done, how, why and how much. Mac's was recommended to me by a friend who has taken his cars to Mac's for years. I had an issue with my brakes and they told me it might be pretty pricey if the calipers had to be worked on as well. To my delight, they said it was just the pads that needed to be replaced and that the calipers were fine. It would have been easy for them to just say yes and charge me the added cost of doing the calipers, but they didn't. I have also gone there for oil changes, to have my brake switch replaced, and to have my cylinders replaced. Each time they have always been upfront, honest, and tried to keep the price down as much as they can. The staff there is courteous and go above and beyond to do whatever they can for their customers. I'm due for a brake check and will be contacting them for that! I would highly recommend Mac's to anyone that lives around the Worcester area. The location may be a bit tricky to get out of, but it's worth the trip as you won't find a better, honest repair shop! I Have been going to Macs Auto for years now. What I like about Macs is they tell you like it is they do not force repairs on you. Why did I visit Macs the first time it was by word of mouth, and the fact that I was fed up with the dealer prices. One of the times I was at the dealer they told me I needed brakes it cost me close to $700 dollars. The next time I needed brakes I went to Macs and was astonished the price was in the $300s, that one experience made me a long time customer. They are very reasonable and accommodating for instance this winter when I operated my window switch the window regulator broke with the window down on one of the coldest days of the season, when I went to Macs with no appointment they were able to raise my window and send me on my way in 15 minutes and didn't even charge me for the service. Another time with my Chevy Venture the windshield wipers got stuck in the up position, I remember visiting the dealer in the past for this same issue yes it was in the winter and due to snow, when I was at the dealer they charged me $150 dollars to repair it, they said the wiper arm motor was broken. The following year it happened again, during one of my oil changes at Macs I mentioned this windshield wiper problem and Macs was able to fix it in 3 minutes with no tools and also no charge. It is these little things that make them stand out as an excellent Auto Service provider and the only way I ever see not using them is if the car repair is in warranty and I have to use the dealer.